Roller derby is an all female contact sport played on quad skates on an oval track. Players always skate anti-clockwise. Each match or roller derby bout is divided in two 30 minute periods which are split into 2 minute races called JAMS. There are two teams with 5 players each. The group composed of 8 players and situated ahead of the track is called pack. It is constituted by 4 players from each team (the blockers) two of them being the pivots which lead their team and can be recognised by a thick stripe on their helmet covers. Pivots organise the pack and plan the strategy. Blockers stop the opposing jammer from going through the pack and help their own jammer pass through. At the start of each jam the pack groups between the pivot and jammer lines. 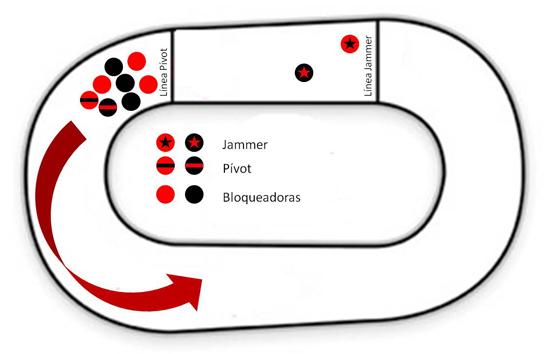 The jammers are the fastest players of the team and they stand behind the jammer line. They have a star on each side of their helmet and their role is to score points for the team. A referee watches each jammer and count the points, other referees keep an eye on the pack skating outside the track and inside the oval, there can be up to 7 referees in a bout. When the whistle blows the jam begins and the pack and jammers start skating. 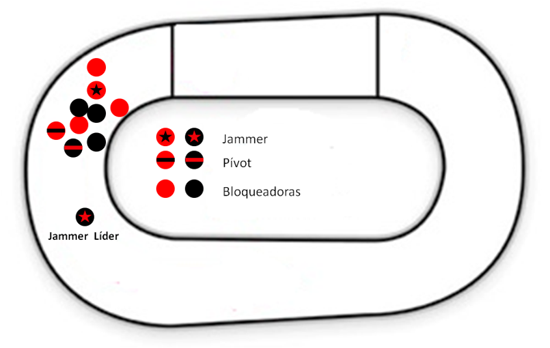 The jammers start their first lap around the track in which they don’t score any points. The first jammer to go through the pack legally is the lead jammer, her jammer referee will point at her and will blow the whistle twice in that moment. 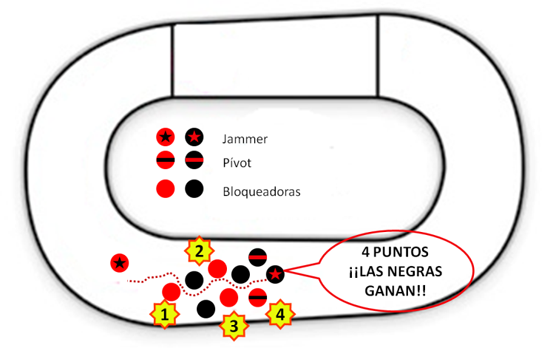 From then on the jammers score one point for each oponent blocker they pass. The lead jammer can stop the jam before the two minute time is up by repeatedly touching her hips.